At this time of year my neighbor is usually overloaded with fresh rosemary from her greenhouse garden. She grows it over the winter and by spring she is swimming in the stuff so she kindly shares some with my wife and I.
I do my best to use as much as I can in my cooking because most of it ends up going to waste. I haven’t learned how to dry it yet (that’s on my to-do list this year). I love the fresh and hearty flavor of rosemary so I add it to whatever I can. Last week I made rosemary-flavored custard. 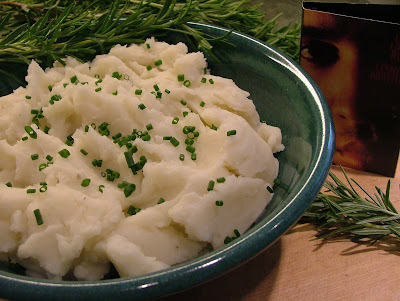 Over the weekend we added fresh rosemary to the beef stew and I this time I'm using it in my mashed potatoes. Rosemary mashed potatoes are very easy to make if you follow this simple method. Warm some milk in a pot, toss in a sprig of fresh rosemary and let it simmer for a few minutes to flavor the milk. The warmed flavored milk is then added to the cooked potatoes while mashing them. I served these potatoes with the leftover beef stew and it was excellent! Sometimes a word such as “rosemary” will make me think of a certain song. In this instance it reminded me of a song called Rosemary by Lenny Kravitz. This song was off his first album called Let Love Rule, which was a favorite of mine when it was released in 1989. I hummed the tune in my head while enjoying the subtle aromas of rosemary in my kitchen. It was one of those relaxed cooking experiences I absolutely love! Place potatoes in a large saucepan. Add enough cold water to just cover potatoes. Bring to a boil over high heat. Reduce heat to medium-low and simmer until potatoes are fork tender, about 10 to 12 minutes. Drain potatoes. While potatoes are cooking, in a small saucepan, melt butter over medium heat. Add milk and rosemary. Cook until milk is heated through. Remove rosemary from milk. Using a potato masher, mash potatoes while gradually adding warmed milk. Beat after each addition until potatoes are light, fluffy and no lumps remain. Add salt and pepper. Mix well. 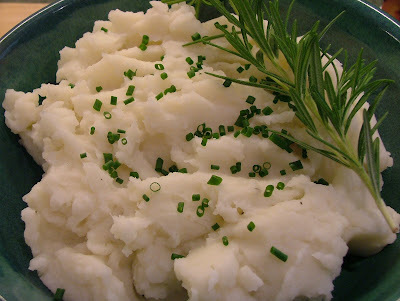 Transfer mashed potatoes to a serving bowl and top with chives. Serve hot.